Ronan Morrissey of the Waterford News & Star with city man Chris Hoare. 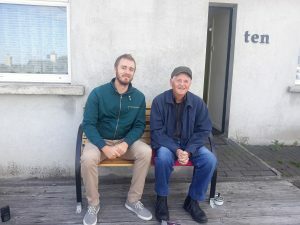 IT didn’t take city native Chris Hoare long to realise he would be happy back in Waterford after almost 50 years in Australia. Shortly after moving into his new home off the Yellow Road at Ard na Greine during the spring, Storm Emma gifted him an unrelenting snow-shower, essentially locking him indoors. Amazed by her goodwill, he purchased a gift voucher and thank you card, writing on it that he thought people going out of their way to help others in such ways were a thing of the past, thanking her for her selflessness. Chris’ father, a Roscommon man, met his wife in Waterford on a trip down from the Curragh where he was in the army and the pair would rear their family on Blake’s Lane having lived on Connolly’s Place. His mother carried 19 children, including five sets of twins, but unfortunately seven were lost. Chris describes his upbringing as harsh rather than difficult. Much of what was done was simply ordinary for that era – for example at the age of 12 he began working as a messenger boy for Dr Cullinane across from where Geoff’s sits today and Prescott’s drycleaners at John Robert’s Square. His education, he says, only began when he started doing crosswords and reading in Australia. “I didn’t give it a thought, it was just something you done. I was in for six days a week and I don’t know whether my mother knew it or not but I used to get Thursdays off. I used to get two and sixpence for working. I would give the money to my mother and she would give me back the sixpence. As he grew older he moved on to Waterford Crystal where he was initiated by falling for the old ‘bucket of steam’ and ‘left-handed’ spanner tricks before passing them on to newbies who followed him later. The memory that stands out from his time there wasn’t the banter but the slog working on regular glasses day-in and day-out. Eventually, he followed his brother and sister to London working for Heinz before a stint on the railways. Young and full of life with hot feet, he didn’t dwell enough on missing home to get homesick so he didn’t baulk at seeing an advertisement in a broadsheet newspaper attempting to lure people to Australia. For four weeks and five days, Chris was one of 1,000 people aboard the Sea Sky, with eight-hour stops giving him the brief chance to wander around Las Palmas, Cape Town, Perth and Melbourne before landing in Sydney. Having arrived down-under, he changed his surname to Condon, his mother’s maiden name, for official purposes as Hoare sounded a bit offensive. Working in the steelworks offered him a chance to save before moving to Sydney where he picked up a job drilling new routes for the Eastern Suburbs Railway. He stayed working on the railways for 43 years. Chris warmed to the Australian people, never feeling the urge to seek out the Irish, and even acclimatised to the sizzling sun. On the 14 occasions he returned for holidays, he arrived into Waterford with a couple of bob but went back with my pockets full. In recent months, he returned to a Waterford and Ireland which he says are in a much better place economically and socially to the ones he left. In the morning he can wander down to Lisduggan for a few messengers and the odd night he can go for a few pints on Barrack Street. Stating he wears his heart on his sleeve, he admits that he shed tears at his brother Pat’s rendition of Mickey MacConnell’s Only Our Rivers Run Free during a night of traditional music on Barrack Street recently and since returning to Waterford, he has enjoyed several nights at the dogs with his family. Last Tuesday, he was making the most of home comforts by sitting out his front garden reading Ian Rankin’s Even Dogs in the Wild. The book, he adds, was one of several in a bag given to him by the same neighbour who braved the elements to check on him during the March blizzard which greeted him to Ard na Greine.